This easy recipe for pasta with mozzarella and turkey meatballs is a fun spin on the classic spaghetti with meatballs, and has the extra added advantage of coming together in about 20 minutes for those busy weekday nights when you know you should make dinner, but you don’t want to, but you should. 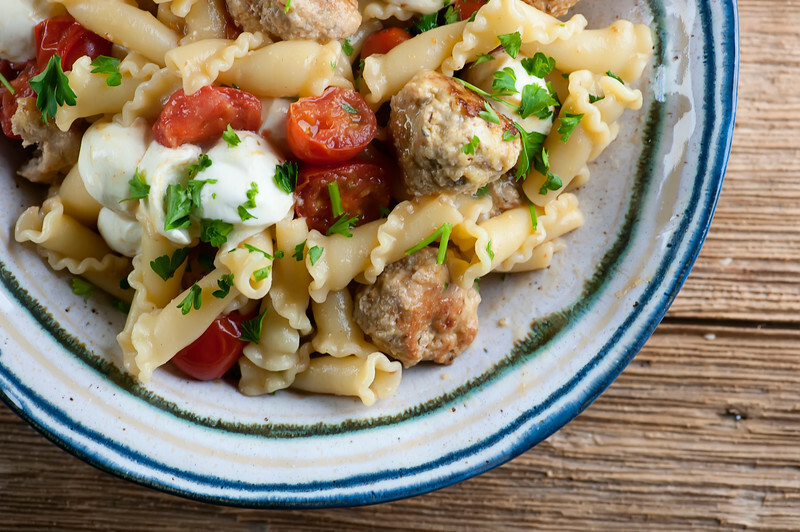 If you can hang in there for those twenty minutes, you will be rewarded with a nice warm bowl of pasta with cute little meatballs, sweet cherry tomatoes and melty mozzarella, and if that isn’t incentive for spending those twenty minutes in the kitchen I don’t know what is. Let’s make it!And just for record, I have those days on the regular. When I pretty much want to climb into my bed with my trusty nap companion. 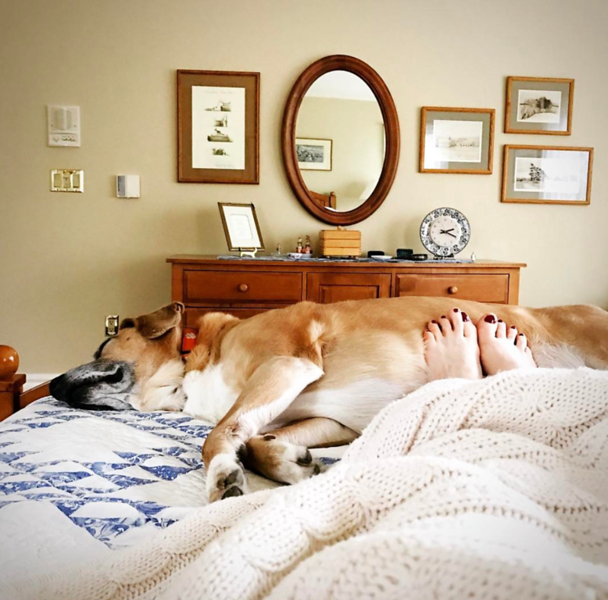 Side note: dog bellies make the BEST foot warmers. My mama found me Hula Hoops recently and gave me three little bags for St. Patrick’s Day. I am hoarding them, except for this one bag that was dinner on One Of Those Days. However, if you can find the energy to do it, as much as I love and adore Hula Hoops, I have to say that this pasta dish does make for a more satisfying supper. You are going to brown them up in a skillet, and then finish them with some chicken broth. 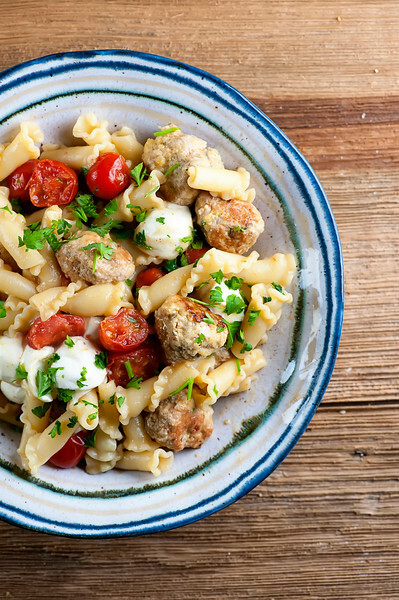 Toss in some cherry tomatoes, some cooked pasta and a bunch of little mozzarella balls – they are called bocconcini (which I think translates to little mozzarella balls), and if you can’t find them just cut up some fresh mozzarella into little chunks. The heat of the sauce and the pasta is going to melt the mozzarella just a teeny bit and at this point you will be all kinds of happy that you went for this supper. Scoop it up into warmed bowls and make sure everyone gets their fair share of meatballs and cheese. Mix together turkey, breadcrumbs, egg, 2 tablespoons parmesan cheese, 1/4 cup parsley and a pinch each of salt and pepper. Roll into small meatballs, about one inch in size. Heat butter in a large deep skillet over medium high heat. Put meatballs in skillet and cook until just browned on all sides, about 5 minutes or so. Pour in chicken broth and simmer the meatballs for ten minutes – you will have a little bit of cooking liquid left at the end. Add the tomatoes and cook for another minute. Cook the pasta according to package directions, and scoop out some of the pasta water before you drain it. Pour the pasta into the skillet with the meatballs and add the remaining parmesan cheese, parsley and butter, along with the mozzarella. Stir to combine, drizzling in a little pasta water if needed to loosen things up. Season to taste with salt and pepper. Divide among warmed plates and serve, garnishing with a little extra parsley. This is the kind of meal we need at our house right now Kate! It seems like I’ve been so busy lately that before I know it it’s edging close to dinner time and I’ve got nothing goin’. I love how this comes together so quickly but still looks so delicious and filling! Thanks for sharing. 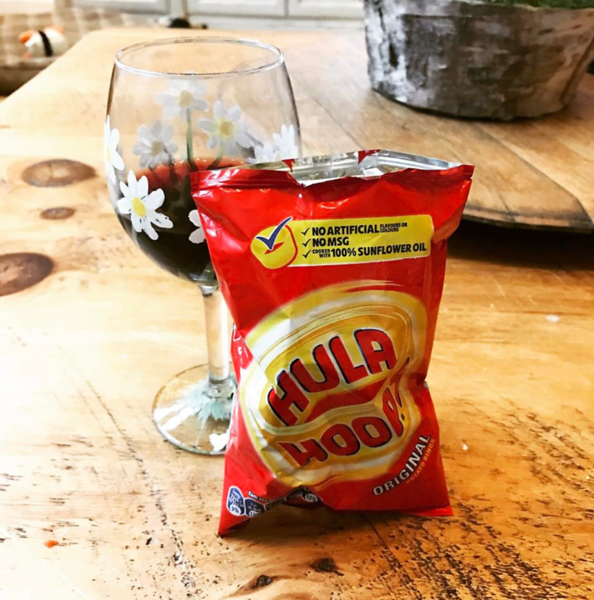 And what the heck is a Hula Hoop?! I’ve never even seen those! i really like seeing pasta dishes without marinara sauce since that has caused brutal heartburn for me lately. great recipe!